Chaotica has added some nifty new rendering techniques to the world of flame fractals, but with the exception of a few interesting works, there is little to take note of. JWildfire is another new flame renderer; perhaps the Great Leap Forward in flame fractals that I’ve been expecting is going to occur with that program’s user group? 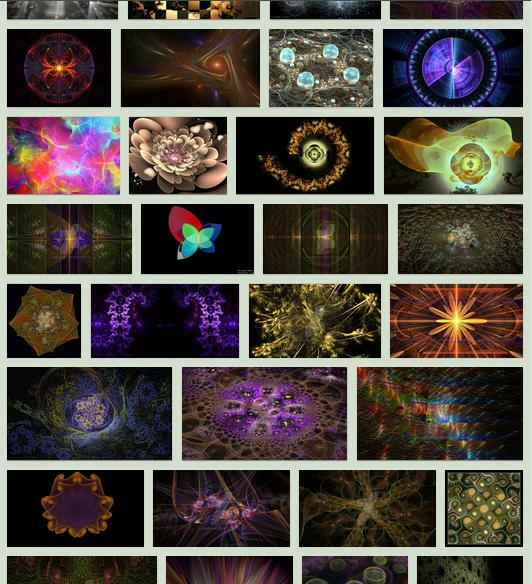 Just like Chaotica, however, it’s produced a handful of cool looking artworks but real creative innovation in the area of flame fractals hasn’t been affected much by its advances in rendering. 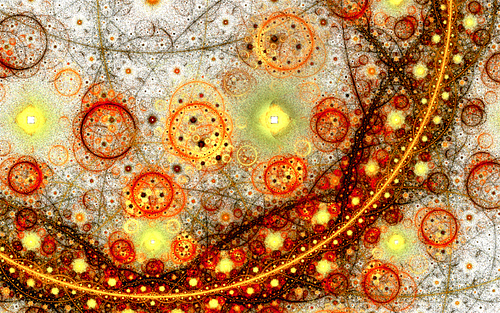 The genre of flame fractals remains a place of ever increasing rendering refinement but stagnant artistic expression. Man, that sounds grim. Here, let’s take a look at some of the better, new and improved flame fractals from JWildfire and forget about all that other stuff. These works are truly exceptional. You ought to read the statement on this guy’s DeviantArt page that explains why he abandoned the place. It’s interesting that his work also stands out as some of the better stuff. 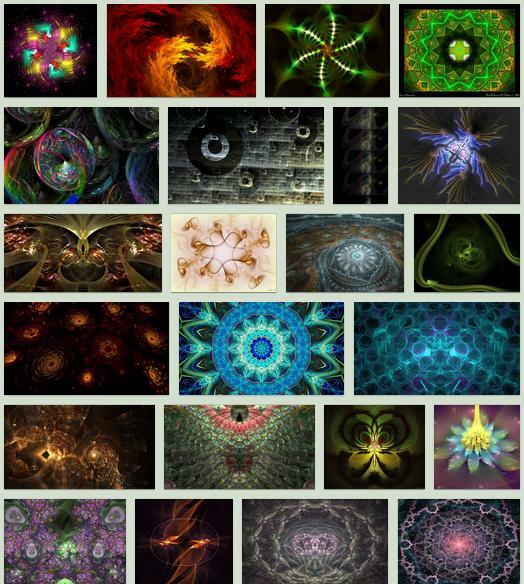 The fractal art world is infected with the usual social dysfunctionalisms that plague every interactive venue in the online world. Once again, the rich rendering ability of the program is used well to enhance the subject of the image rather than prop up the subject of the image. The classic mandelbrot patterns become a theme within a larger them of “circles in straight lines.” I think I like this one because of it’s strong design qualities; geometric but not repetitive. Thargor, if I’ve got this right, is the author of JWildfire as well as one of it’s most prolific and creative users. This image features one of its new “hard” flame rendering methods that introduces a solid look to what was hitherto wispy and translucent. Furthermore, it expresses a dark, disturbing sensation, as the title, Endless Nightmare, suggests, of something unpleasant that you can’t escape from. It’s interesting that the author of the program, undoubtedly a highly skilled, technical person, also has such a feel for artistic expression. But maybe that’s what inspires and motivates him to keep developing the program; he’s trying to produce a more creative program. I always felt that when using programs like Sterling and Tierazon, an awful lot of the artistic style in the appearance of their images was a direct product of the author, Stephen Ferguson’s own artistic imagination which went into designing the rendering methods. They don’t have DeviantArt group? I thought Chaotica users were into Cloudscapes but it seems to be a common theme among all “Flamers”. 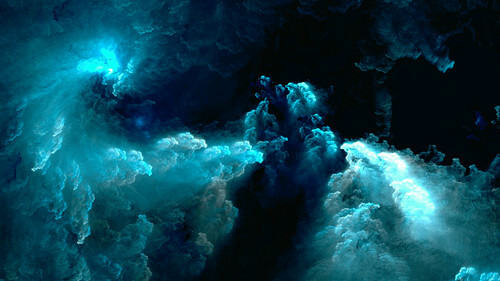 Although I think the cloudscape theme is a little limited artistically this one is much more energetic than most and quite captivating in detail as well as flow and movement. It’s not the usual swirling toilet bowl class so often seen, but is more like the sky from one of the great landscape painters. There’s a lot of landscape paintings that feature a huge, panoramic sky so I guess it’s natural for flamers to pursue such a theme as this. This could easily be an underwater scene as much as a sky but works well I suppose either way. The rendering almost produces a hybrid, thick-air, thin-water medium. One difference I noticed between JWildfire works and ones by Chaotica, was a greater talent for astronomy themes. Or perhaps ElenaLight is just more talented at getting the program to create this sort of space imagery? If you click on this one and view the full-size, it’s even more impressive as the star patterns made by the little points of light look extremely realistic and give this “synthetic” work a profoundly natural quality. This is the sort of “higher development” in flame fractals I’ve been hoping for. This image stands alone as something worth looking at and not merely “a good example” of JWildfire. 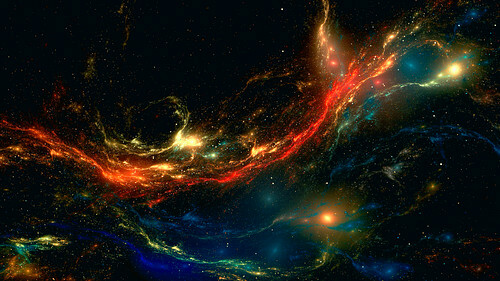 Flames in space? I was really shocked when I found this one because it was so subtle and yet intense. The colors are beautiful but they’re also just part of the team of elements that all work together to make this simple flame a real hit. Luis’ gallery has a lot of these kinds of images and just like ChaosFissure with Chaotica, he gets a little obsessed with the theme but maybe that’s what you have to do if you want to make a few really good ones. I’d like to say a whole bunch of great things about this image but apart from checking out the starry details in the fullsize version, words seem rather inappropriate when talking about artwork like this which speaks so well for itself. 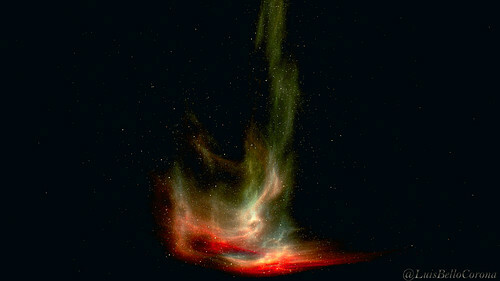 Why is it so much better than all the other wispy “flames in space” out there? Good art is a lot harder to explain than good rendering. The title of the work is longer than the comment… but that’s DeviantArt for you. You will recognize immediately a Frank Frazetta style to this one, just as many Chaotica fractals have a Rembrandt style to them. Frank Frazetta painted fantasy themes and gave them a blotchy style instead of a brushy style. It was a departure from what most fantasy painters tried to do, which was make their works look more like traditional paintings. Frazetta tried to make them look better. So what is this image? Sky? Space? Underwater? I think Luis just called it a texture because it has that elusive quality that is best described by not attempting to describe it. Or did Luis not appreciate his own work as much as I do? I think it’s a nighttime vision or dreamscape. That’s the bubble-ish quality and the dark pinnacle in the lower middle is a small but steep rocky place where contemplation occurs and visionary light springs forth. Or how about “Genie from the bottle”? 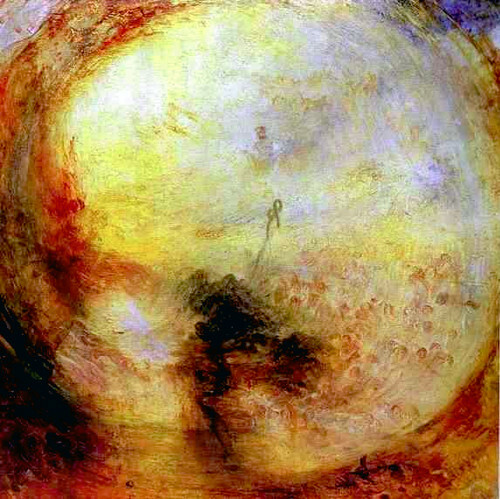 Turner really goes overboard with his title, doesn’t he? There’s enough words there for three paintings and a haiku poem to follow. A commenter here once criticized “suggestive titles” as tools to prop up meaningless art. Maybe he’d never heard of Turner? (or anything else). 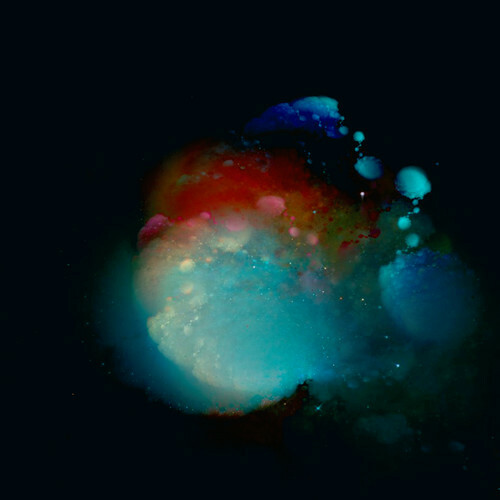 Flame fractals, like much of algorithmic art carries on the long established category of abstract expressionism of which not all of it is so abstract, as is the case here with Turner’s visionary smudge. It’s interesting how old art themes can reappear decades or even centuries later. So, is JWildfire any better than Chaotica, or what? 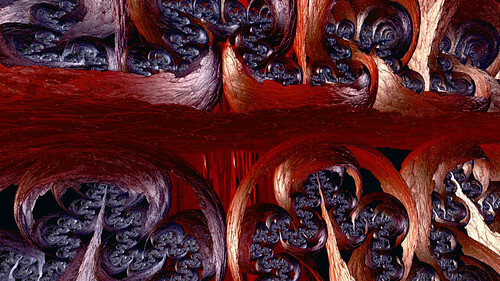 Overall, I’d say the two programs are tools of equal creative power for flame fractal users (flamers). But just as I concluded in my Chaotica posting, the genre of flame fractals is still a lean place for visual creativity even if it is becoming a richer place for rendering options. Noteworthy artwork can still be made with programs like this, as is the case with the examples I’ve reviewed here. 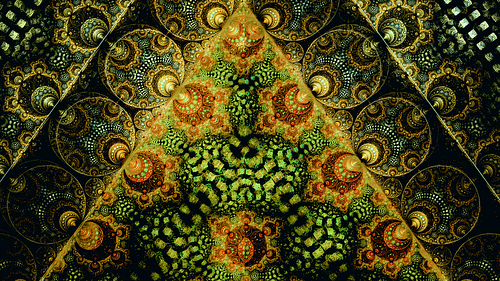 And more examples will be made in the future, I’m sure, but for the average user, flame fractal algorithms are still just something to play with and not the algorithmic world to explore and make discoveries in like other fractal algorithms, such as the 3D variety, are. In my next posting I will show you what a really creative program can do for you without all the fancy, “cutting-edge” rendering toys. If you want me to show you something better and not just complain about what everyone else is doing (or can’t do), my next posting I believe will do that. ← Is that all there is to Chaotica? The BMFAC 2010: An Audience of Winners!